I’ve been a firm believer of facials for decades. When I was younger, monthly facials were meant for maintenance with thorough deep cleansing, masks to keep skin clean and healthy. As I age, facials now serve a different purpose. Besides maintenance, they are targeted on concerns of sagging skin, dullness, dehydration, skin tone evenness and the list goes on. I gradually see myself in need of anti-aging solutions with more sophisticated tools and technologies. I’m glad to have met Bella Skin Care and had my facials there the past months. After my fair share of experience with many facial establishments, it’s not often I find one as comfortable as Bella Skin Care. I’m impressed that most of the staff is long serving, relaxed, happy and dedicated. That closeness they have amongst themselves like a family translates to better customer service, professionalism, non-pushy nor excessive sales talk. During the first visit, all customers will be given a thorough consultation to determine the types of facial suitable for your skin type and condition. I was recommended the Hydra Intense Solution and alternate it with Indiba Treatment Lifting to cater to my combi skin (oily t-zone but dry surface) and also concerns in aging and sagging skin. It quenches and restores hydration with the purest form of Hyaluronic Acid. It also speeds up tissue repair which means cutting down on healing time. And that warm mist of pure Lavender sprayed at the beginning of the treatment sent me into sleep mode right away. The facial took about 90 minutes. Skin feels supple and renewed after one session. If you have dry skin or need some form of rejuvenation, do take note of this treatment. I was also offered a complimentary hand paraffin and hand massage for this facial. Instant fix! Fresher and brighter skin with noticeable change in my facial contours. It utilizes the Indiba machine from Europe to deliver the high frequency Proionic Treatment through employing heat. It is also safe to be used around the eye areas especially under the care of a trained therapist. The therapeutic treatment ended with an Oxygen Mask and a shoulder massage. This facial is about 75-minutes. For those with concern on crow’s feet, wrinkles, under eye circles/bags, double chin or sagging skin, a session of this facial gives you instant results especially in the firming of skin. It certainly gave me better facial contours and redefined my jawline further. This is the treatment to have before special occasions or dates. To me, it’s the gold class of RF treatments. For this facial, I was offered honey wax hand mask after the hand massage. Bella has different hand treatments (and experience) to complement the different facials. That’s back to the good old facials and more! I believe the effects of facial treatments should be maintained and leveraged on after each session. Below were some home care recommended for my combination skin (oily t zone and slightly dehydrated on the cheeks and rest of the face) and have worked very well so far. 1. 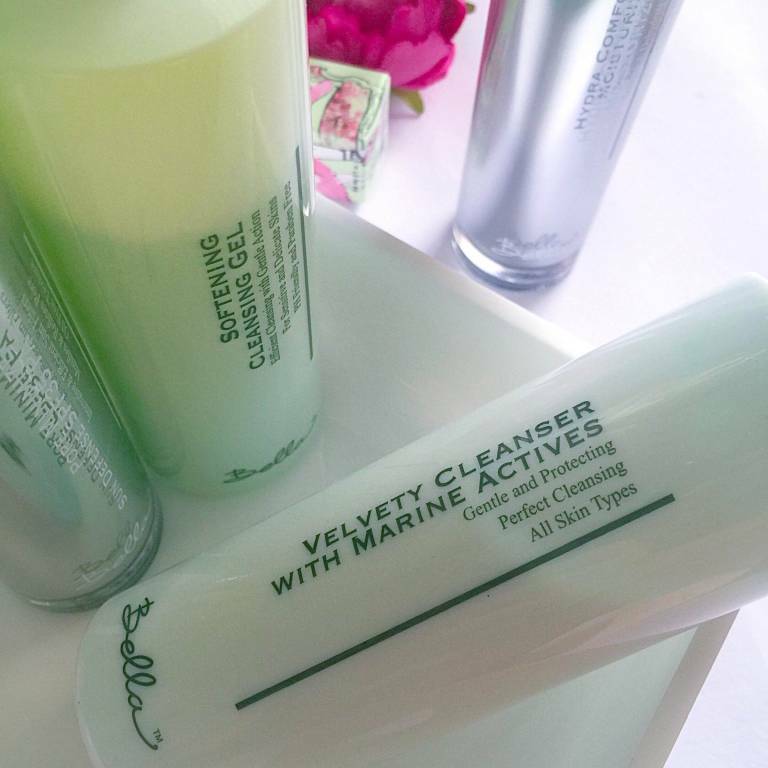 Velvety Cleanser with Marine Actives: removes makeup so gently and it’s safe for daily use and even on days when my skin is acting up. 2. Softening Cleansing Gel : Love the refreshing scent of botanical extract and it does not leave my skin feeling “squeaky” as though all the natural oil has been stripped. 3. Hydra Comfort Moisturizer : Truly hydra-filled! Suitable for sensitive skin too. Love that it is non-sticky & lightweight! 4. Pore Minimizer Sun Defense SPF35 PA ++ : My top favourite, a multitasker! A lightweight sunscreen with physical filters, mattifies, refines pores, reduces pimple outbreak and prevents premature aging. It leaves a nice light tint which brightens up my skin. Big love! The above treatments took place at International Building Branch which I heard has been around since 30 years ago (Bella Skin Care was established in 1982). I’m impressed that after all these years, Bella has preserved the tradition of the good old facial. What keeps me excited about Bella facials besides the efficacy of the treatments is how they are being executed in such a pampering, relaxing manner by a team of warm and professional advisors and therapists. Bella skin care products.. Sounds Interesting.